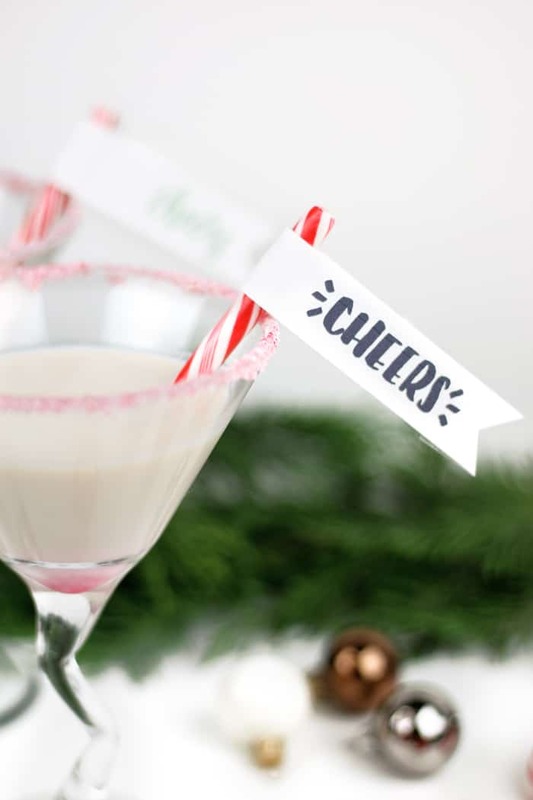 The Peppermint White Chocolate Martini is a lovely after-dinner sipper for the holidays. 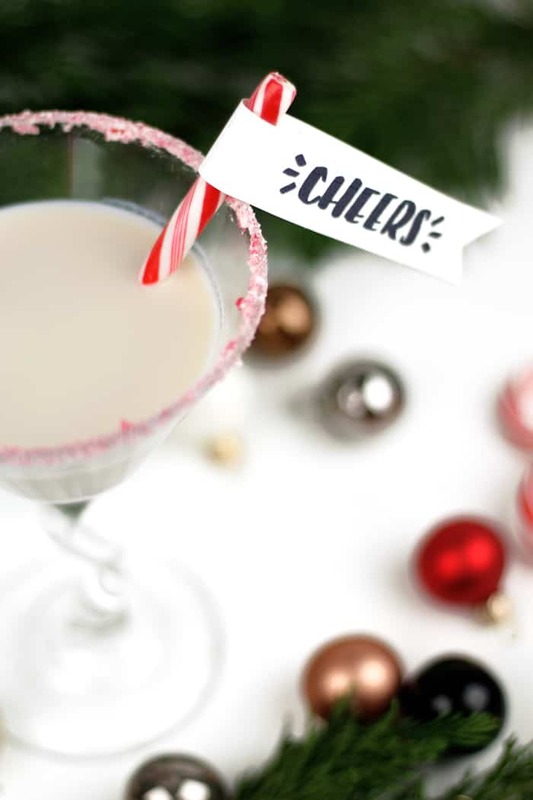 Garnished with a candy cane drink flag, this festive drink features white chocolate liqueur, flavored vodkas and Irish cream. Holiday parties are here and I’m not mad about it. I went to my second one last night, and it was so lively and merry! We drank lots of whiskey cocktails, and my favorite was a whiskey + milk punch. Dairy-based cocktails don’t get enough love, I think. There’s the white russian, which is everyone’s go-to drink at least once in their life. There are so many other ways to enjoy milk and cream with a spot of alcohol, though. 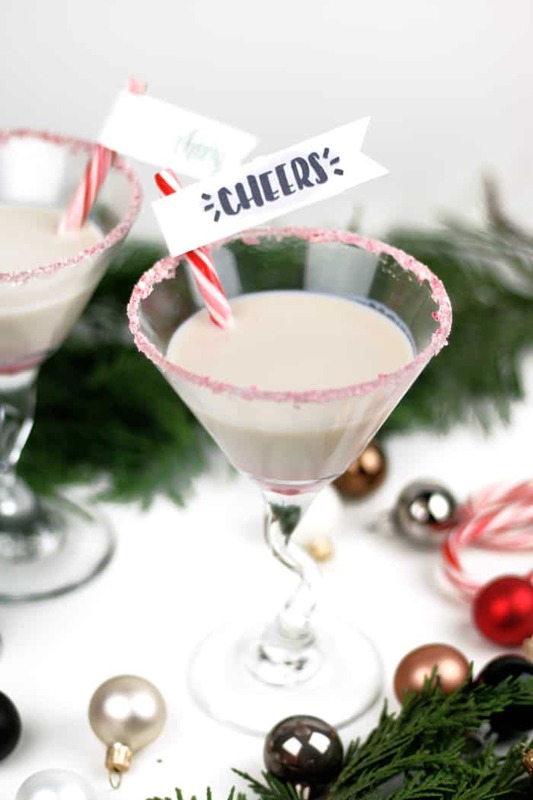 One of them is this holiday-inspired Peppermint White Chocolate Martini. 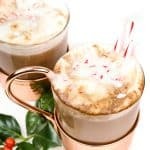 It’s a creamy and minty after-dinner drink featuring white chocolate liqueur, flavored vodkas and Irish cream. I used these quirky zig-zag martini glasses and garnished it with a rim of maple syrup and crushed candy cane and a cute candy cane flag for an extra touch of holiday spirit. You can download a printable PDF of those flags at the end of this post! Aren’t those flags so adorable? My friend Colleen of Lemon Thistle made them! She has a brand new e-course on brush lettering. Get a free printable download at the end of this post, after the recipe! I’ve always admired Colleen’s fun printables featuring her beautiful penmanship, and it’s so exciting that she’s now sharing that know-how with others. 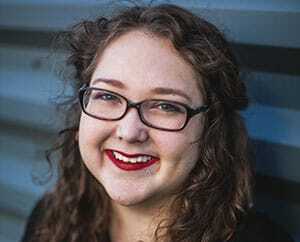 I’ve seen the course workbook and can say confidently that Colleen makes everything so informative and shows you how to easily find your own style. If you’ve ever wanted to try brush-lettering, consider this course! Colleen’s course covers everything from picking up a brush pen (and how to hold it) to variations of letters to help define your unique style to flourishing and final composition. Plus there are bonus sections on digitizing your work and lettering on surfaces (for rad DIY projects!). Check out all the brush-lettering course modules. Love peppermint? If you can’t find peppermint vodka, then peppermint schnapps or uncolored crème de menthe will do just fine. Not a peppermint fan? You can nix the mint features of this cocktail and enjoy a white chocolate martini. It’s still 100% delicious — trust me. I drank that when I ran out of peppermint vodka! 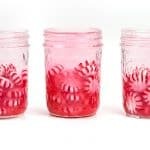 And you can still garnish it with a candy cane flag, though the candy cane flavor and pink coloring will dissolve into the drink the longer you let it sit. 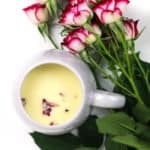 Also, if you can’t do dairy, check the ingredients on the creamy liqueurs and opt for a non-dairy milk instead like almond milk or soy milk. 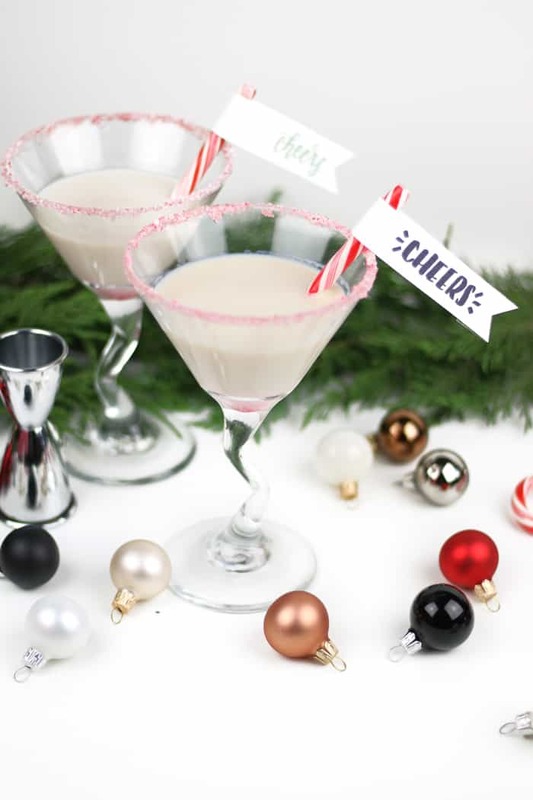 Pin this Peppermint White Chocolate Martini! A festive, colorful and minty cocktail for the holidays. So cute with Candy Cane Drink Flags! Place 2 candy canes in a plastic bag. Cover bag with a cloth. Use a meat mallet to crush candy canes into powder with some small chunks. Pour crushed candy cane onto a plate. Pour maple syrup on another plate. Roll the outer edges of 2 martini glasses in the maple syrup. Let any excess drip off. Then, roll the edges in the crushed candy canes. 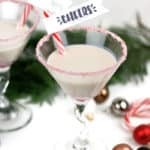 In a cocktail shaker filled with ice, combine white chocolate liqueur, peppermint vodka, whipped cream vodka, Irish cream and half-and-half. Shake vigorously. Strain into a rimmed martini glasses. Garnish with additional candy canes. Download the Candy Cane Drink Flags! To make Candy Cane Drink Flags: Download the PDF via the button below. Then print them on 8.5 x 11-inch paper. Cut out the flags with scissors or an X-acto knife. 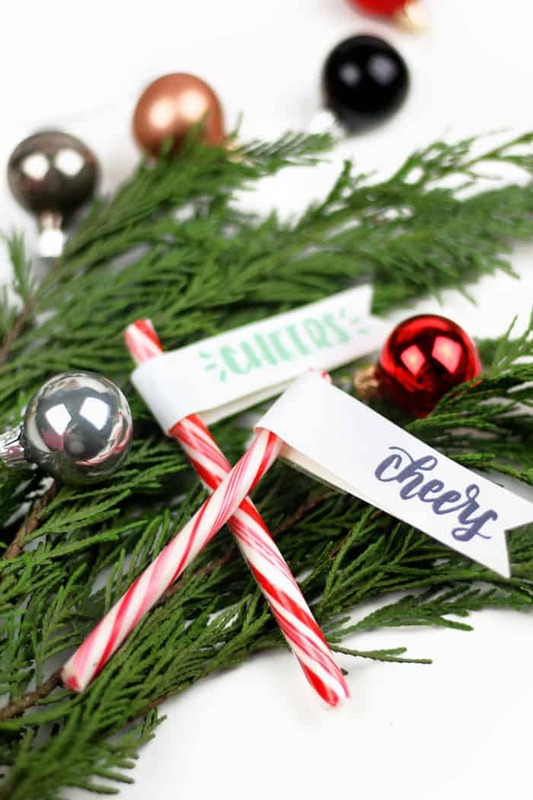 Use double stick tape or glue dots to fold the flags around an unwrapped candy cane stick. (I used regular candy canes and cut the round part off with a knife. 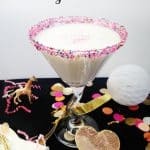 I used the excess tops to crush for the candy cane rim on this drink!) Insert into a drink and enjoy! These are the ACTUAL CUTEST, Susannah! And I desperately want one tonight!